The city of Stockton in California was built during the gold rush to facilitate trade and provide easier access to the southern gold mines. To this day, due to its strategic position on the San Joaquin River, Stockton is a port city that serves as a gateway for goods to and from California’s Central Valley region. While not a large metropolitan area for California, Stockton-Lodi’s population of 725,000+ would be formidable in most states. When it comes to professional sports, Stockton is a minor league town hosting AHL affiliate of the NHL’s Calgary Flames, the High-A baseball affiliate of MLB’s Oakland A’s and the NBA G-League affiliate of the Sacramento Kings. Perhaps Stockton’s biggest sporting claim to fame is in MMA, as champion UFC fighters Nick and Nate Diaz call the city home. When it comes to soccer, Stockton’s history is mostly indoors with the California Cougars of the PASL calling the town home from 2005-2011. The city is about a 45 minute drive from the USL’s Sacramento Republic and an 1 hour 15 drive from MLS’s San Jose Earthquakes in clear conditions. Next season, a group is bringing the city its own local soccer club in the National Premier Soccer League team. 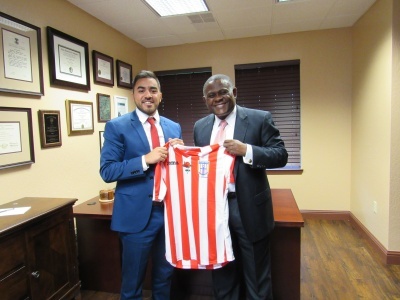 Stockton FC is the creation of lifelong Stockton resident Christopher Hernandez, and world renowned pathologist Dr. Bennet Omalu. Dr. Omalu is well-known for his study of chronic traumatic encephalopathy (CTE) in American Football players. His story was featured in the book “Concussion” and he was played by Will Smith in the 2015 film of the same name. The founders of Stockton FC hope to give a city that has been through some hard times something to rally around as well as to create opportunities for local soccer players to get noticed. The 2008 financial crisis hit Stockton hard, and making it the second largest city in the USA to go through bankruptcy, from which it just emerged in 2015. The Stockton-Lodi metro area’s depiction in popular crime TV series “Sons of Anarchy” during that period also did not lend itself to positive external perceptions. We spoke with Christopher Hernandez, president of Stockton FC, about their goals for the club to contribute to the positive renewal of Stockton. 1. Why did you decide to start a new soccer club in Stockton, California? We have always had a need for a club here in Stockton. This is the highest level of grassroots soccer the city has ever seen. It has always been in demand. There are a lot of players in Stockton who have the talent for this level but not the platform. 2. What drew you to the NPSL? I know people who are involved with Sacramento and Academica, and they have nothing but great things to say about the NPSL. We are really excited to be part of the NPSL. 3. Do you have a venue selected yet where Stockton FC will play? We have a couple of options. It is not set in stone. Within the next few weeks we should have that nailed down. 4. Who are the natural rivals for Stockton FC among the clubs in the NPSL’s Golden Gate Conference? I don’t think we have earned the right to call anyone a rival yet. I think the rivalries will develop out of respect from other clubs; that comes from playing them on the field. 5. Stockton is not too far from Sacramento, which has a popular USL team trying to get to MLS, and San Jose, which has the Earthquakes in MLS. How much are local soccer fans drawn to these teams? As far as I am concerned, we don’t see any of those teams being “our” teams. They are quite a drive away. Stockton is a very community based city. We have had some local players trial with those clubs, but no one has really broken through. With Stockton FC, we will have something to call our own. 6. Who are the investors in the team, and what are your backgrounds? We have one lead investor. His name is Dr. Bennet Omalu. He is a world famous pathologist. Right now, Dr. Omalu and I are the only investors and we are happy to get the club established that way. 7. What is the long term vision for the team? Do you see the short season competition as the right long term fit in Stockton, or do you think you can grow into something like the full season, so called “NPSL Pro”? We are in a three year contract with the NPSL. We would like to bring the community as close together as possible, driven behind the idea that now our community has a platform for higher level soccer. We want every kid in the area to have aspirations to play for Stockton FC. That is our long term goal. In the short term, we aim to get our name out to players in the area who have not tested themselves at this level yet. We would like to help get them exposure. We want to build our connections both domestically and internationally. We would like to create ties to have relationships with clubs who are interested in doing business with us. 8. I noticed that you already have a logo and a even a jersey on your website, stockton-fc.com. Can you share the reasons behind why you chose these designs? Red, white and blue colors: Stockton has been nominated four times for an award called the All-American City. I wanted to incorporate something that has meaning to folks around here. Stockton is an All-American town. There are people from all walks of life, every color and every economic background. The anchor in the logo: Stockton is known as a port town, which is where the anchor comes from. Stockton has a reputation for importing and exporting goods into and out of California. The port has been a driving force of the economy since it was founded. You see the anchor everywhere in Stockton. The rose on the shirt: It is a metaphor for what we have been through as a community. We were labeled a few years as ago as America’s most miserable city. Prior years were tough on us economically and socially. We have been making great strides as a city in the last few years. I think Stockton’s worst days are behind us. The rose symbolizes what we have been through and who we are as a people. Being able to overcome the hardships we have faced. The rose is from a poem by Tupac, “The Rose That Grew From Concrete.” It is a symbol of our determination to move forward and grow. 9. What else should the readers of Midfield Press know about your club? This is a team for our community. We have never been fortunate enough to have something at the level. Now that we have it, I hope people will support it. Stockton has a reputation for being a blue collar town. I think that will be part of who we are as a club.